Stock will be available on early March This is safe way to warm expressed breast milk, milk formula, milk beverages and baby food. It is very easy and convenient to use. The size is small so that it is easily placed in the house and car without taking up too much space. 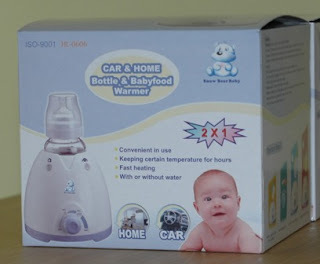 Snowbear 2 in 1 Car & Home - Bottle & Babyfood Warmer and Sterilizer warms bottles in around several minutes. -Expressed breastmilk (EBM) is best to be heated within 35' to 45' celcius to maintain the nutrient composition. -DO NOT heat baby milk or food in a microwave as uneven heating may cause burns to the throat and vitamins may be destroyed. -You may use 40'celcius to heat EBM, 70'celcius to heat baby food and 100'celcius to sterilize your lil's bottle & teats. Such a great function and value buy for mommies! -A fast and safe way to warm expressed breast milk, beverages or baby food. -Comes with a car adapter so it can be used while travelling!